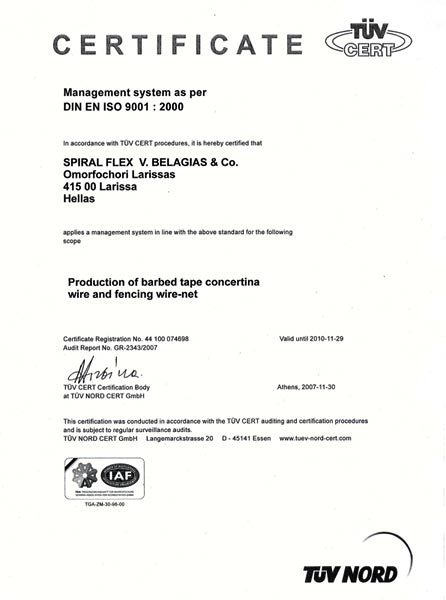 SPIRAL FLEX, was founded in 1986. Barbed Tape Concertina wire "SPIRAL FLEX" was developed to replace standard barbed wire, to deter, obstruct and protect. The SPIRAL FLEX wire consists of a steel strip reinforced with high tensile wire and spear - like barbs at close intervals. Heavy duty clips form a concertina configuration with diameters from 450 mm to 1.000 mm. The coils can be attached to existing fences or used independently as a barrier line. The system is used widely by the military, industry, commerce, prisons, airports, refineries, etc. SPIRAL FLEX provides for a wide variety of installation configurations, any one of which may be selected to meet the degree of security required, according to the need at any particular site.